Many Christian hymns of an eschatological emphasis have used the language of John’s picture of the New Jerusalem extensively, a Jerusalem situated in the very heart of the new heaven and earth. In the past generation especially, there has been increased momentum for questioning whether John intended his picture of the New Jerusalem to be taken as a fairly literal description of a place called heaven. Some are suggesting that John’s pregnant imagery of streets of gold and pearly gates points not to a celestial location, but rather to a celestial people, namely the people of God, the Bride of the Lamb (e.g., R. H. Gundry, “The New Jerusalem, People as Place, not Place for People.” Novum Testamentum 29 (1987) 254-64). From this newer perpsective, John is talking about the real people of God, rather than the real estate of God. This means that it is saints who are depicted with such luxurious iconography and seen in a state of glorification. The basis of this approach rests upon the very close connection that John himself establishes between the New Jerusalem and the imagery of a bride, a bride that clearly represents the people of God. In the opening verses of Rev. 21 John sees the holy city, the new Jerusalem, descending out of heaven from the presence of God. The prophet then immediately describes the New Jerusalem with these words, “prepared as a bride beautifully dressed for her husband” (Rev. 21:2). Almost identical terms are used in 21:9 to designate the celestial Jerusalem as, “the bride, the wife of the Lamb.” Clearly from these two verses the bride metaphor points toward a people rather than a place. Then one of the seven angels . . . said to me, “Come, I will show you the bride, the wife of the Lamb.” And in the spirit he . . . showed me the holy city Jerusalem coming down out of heaven from God (Rev. 21:9-10). In 21:9 an angel says to the prophet, “I will show you the Bride” and in 21:10 John reports that the angel showed him the holy city Jerusalem. It would be extremely difficult for me not to see the necessary connection between what was promised in one verse and what was pointed out as the fulfillment of the promise in the very next verse. Based upon this perspective, then, we need to seriously consider the idea that the “New Jerusalem,” the “holy city” that descends from God himself, is to be seen as the Bride of the Lamb, the Bride of Christ, the authentic people of God. Let us rejoice and be glad and give him glory! For the wedding of the Lamb has come, and his bride has made herself ready. Fine linen, bright and clean, was given her to wear. Fine linen stands for the righteous acts of the saints. Building upon this truth, that the new Jerusalem is the people of God, the elect, and not a location itself, the consequences are extraordinarily profound. The significance of this new paradigm revealed to John extends far, far beyond merely requiring us to reinterpret favorite phrases from Christian hymnody composed a few centuries ago. First of all, it means the Churches of Christ got this part right all along with its emphasis upon ecclesiology, the doctrine of the church, the fellowship of God. It has only been in recent decades that the Evangelical Movement has begun to appreciate the importance of biblical ideas associated with the congregations of Christ in God’s ultimate plan to bless humanity. I cannot state it any clearer than the prophet John did, “Now the dwelling of God is with men, and he will live with them. They will be his people” (21:3). Contrary to what is regarded as “normal” in many facets of the para-church Christianity of the West, Jesus states with simple clarity that all the spirituality and all the great doctrines of the book of Revelation are revealed to and for the congregations of God, “I, Jesus, have sent my angel to give you this testimony for the churches” (Rev. 22:16). As I have argued in my blog (https://richardoster.com/2013/03/17/tobymac-and-lukes-and-johns-churchy-jesus/ and https://richardoster.com/2013/03/21/a-remix-of-tobymac-and-lukes-and-johns-churchy-jesus/ ) and in my commentary on John’s letters to the seven churches, the Jesus portrayed in the four Gospels and in the book of Revelation is a “churchy” Jesus (Richard E. Oster, Jr., Seven Congregations in a Roman Crucible. 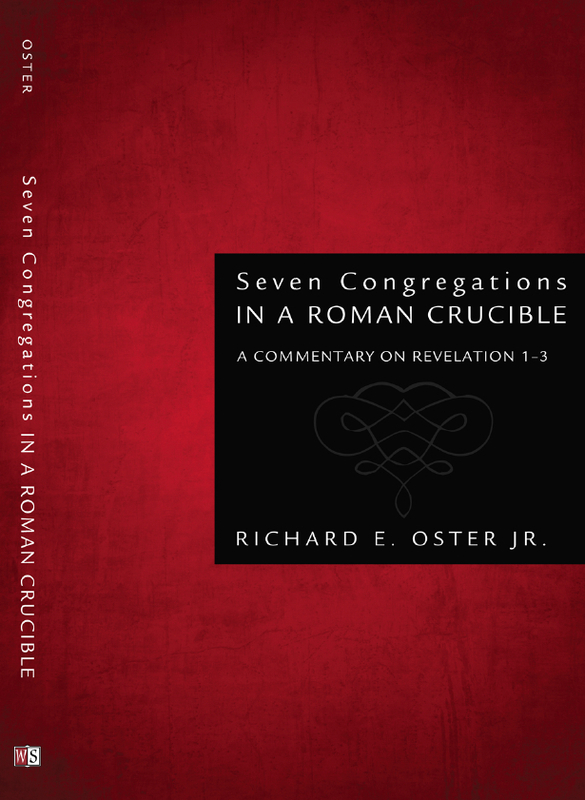 A Commentary on Revelation 1-3, Wipf & Stock, 2013, pp. 88-89). Second, this new paradigm means that unlike the post-mortem rewards for the dead mentioned by Plato in book 10 of the Republic or described by Vergil in book 6 of the Aeneid or at Christian funerals whose number is too great to count, John teaches that the reward for those who follow the Lamb is the sheer inexpressible experience of participation in the very “glory of God” himself (Rev. 21:11a). Make no mistake about it, while we do have some words to describe this new state of glorification and radiance, we simply do not have enough words. It underscores the poverty of our spiritual vocabulary, much like all significant transcendent experiences do. John’s wording to describe the saints in this New Jerusalem are indicative: “brilliance was like that of a very precious jewel” (21:11), “pure gold, clear as glass” (21:18), “decorated with every kind of precious stone” (21:19). The contemplation of God’s participatory beauty and the experiential participation in God’s very radiance should lead disciples of the Lamb to an eschatological longing for Being rather than mere Doing. Consequently, the widespread and longstanding question posed by friend and foe alike, “What will Christians ‘Do’ in heaven for an eternity without ever getting bored,” grows faint (and absurd) in the recognition of John’s vision of Being. Although I truly appreciate the writings of the Apostle Paul (and have a lifetime of studying them to demonstrate my appreciation), the typical interpretation of Paul’s reference to the “spiritual body” in 1 Cor. 15:44 appears dim in comparison to John’s prophetic iconography. I, like Prof. David Aune (Revelation 17-22, Word Biblical Commentary, 52c, 1998, p. 1165), believe that the meaning behind the twelve stones (Rev. 21:19-21) is not just eschatological eye candy, but rather intended to represent the 12 stones on the breastplate of the high priest. Moses and John share a common understanding about these twelve gem-stones. As Exodus says, these stones represent the people of God (Exod. 28:17-21), expressed through the imagery of the twelve tribes as the complete people of God, one stone for each tribe (cf. Exod. 39:9-14). This concurs with the designation of the 12 stones in the apostolic foundations of the New Jerusalem (Rev. 21:14, 19-20). Both John and Moses understand the gem-stones as sensory depictions of the people of God, one people created in the work of God at the election of Abraham and the Exodus and the other people created in the work of God in Christ the Lamb. Thus, like the book of James (James 1:1) and like his own earlier depiction of the followers of the Lamb as 12 tribes (Rev. 7:4-8), this gem-stone pattern reveals the tribal pattern for God’s elect in Christ and highlights a scintillating ecclesiology and eschatology. The outlook of some of the fierce debates arising from the Reformation which were focused on forensic justification and “right standing” with God seems somewhat pale and arid compared to the John’s sensory descriptions of saints whose eschatological Being is both beautiful and iridescent, participating in the very Being of God’s own glory in the new heaven and new earth. It is such a joy to read these excerpts about the will and plan God has for us. I look forward to each one and deeply appreciate your thoughts on this very difficult and controversial subject. Thank you and God Bless! And a simple reading of the text overcomes years of denominational prejudices and preferences, if we have ears to hear. I’m always eager to read your posts. Dr. Oster, I just finished reading your notes after having taught Revelation 21 at two different places today. Thank you especially for your comment about the foundations and the breastplate of the high priest. My first recollection of hearing that the description of New Jerusalem was in fact the Lamb’s wife was when I saw a video by Jim McGuiggan a number of years ago.